With the world’s population set to reach almost ten billion people by 2050, many are questioning how we will feed ourselves. One solution, Professor David Lamb thinks, can be found in precision agriculture. Precision agriculture looks into the use of technology and scientific research to accurately identify the ideal conditions and treatments for growing animals and plant-matter. In the case of Professor Lamb, chief researcher at the UNE Precision Agriculture Research Group (PARG), this means building new technologies and testing their practicalities and benefits for farmers. Precision agriculture operates under the broad philosophy of Sustainable, Manageable and Accessible Rural Technologies, or what Professor Lamb abbreviates to “the SMART way”. His team has taken this in a number of different ways, covering the impacts of coal mining on food production, developing cheap but effective livestock management technologies using drones, as well as remote sensing using satellite communication. The turning point for the group was in 2012, following the federal government’s launch of the National Broadband Network scheme. PARG quickly saw the potential to use this cutting-edge infrastructure to develop UNE’s nearby 2,900 hectare Kirby-Newholme property into Australia’s first NBN-enabled SMART farm. At the heart of the university’s farm is the Innovation Centre. 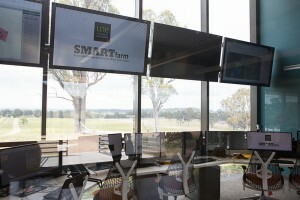 A multimillion-dollar, state-of-the-art facility, the Innovation Centre features a command centre that monitors the activity around the Farm, as well as a seminar room and classroom to provide education and training for students, farmers and the general community on the range of agricultural tools developed on-site.